Something’s wrong with my cat’s eye, so I’m taking him to the vet to get it checked out. I’ll let you know the diagnosis when we get back, but for now, here’s a photo. Maybe this will help someone diagnose their own cat in the future. I suspect it’s a scratch, conjunctivitis or irreparable nerve damage. Whatever it is, he’s not going to be happy in about 10 minutes. As for today’s cookies, luckily, I was able to make them last night. 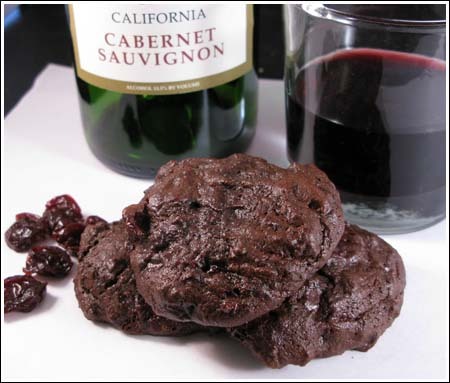 The Food TV red wine cookies sounded perfect for today’s luncheon and since I had half a bottle of wine on hand, I went with that recipe which is here. The cookies are ultra-chocolaty. I used Ghirardelli natural cocoa and chopped up Dove chocolate from Walgreen’s. The Dove, which I love, is really too creamy to bake with and I’ve noted that for the future. You can definitely taste the wine, but it’s not overwhelming. And naturally, the wine in the cookie helps it pair even better with actual wine. So if you re having a red wine tasting party and want to serve something sweet, these cookies would be a good exercise in pairing. Gotta go pack up the cat. Bye for now. Thanks! I need to be better about adding grams. Hi! I found your website when I was looking for recipes for ginger cookies. Since in Italy we don’t have the tradition of ginger cookies I didn’t know where to start. Your recipe for the giant ones is great and now I’d like to try these ones… however I have a silly question. I followed your link and it says 1 stick of butter… we have different sizes here! How much butter is 1 stick? oz or gr is fine… as long as it is measurable! I tried this with the enrgy-x egg substitute and it was perfect. Has any one tried freezing the dough? 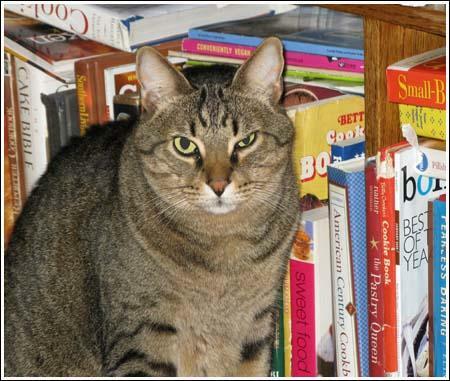 lmao I love how you cat is in front of your cookbooks. Josie, Frinky is really into cookbooks. In fact, my first thought was that his eye was sore from all that reading. The cookies went over well at school today. There were only a few people hanging out in the teachers’ lounge when I showed up, but they had a fun time tasting the cookies and seeing if they could detect wine. What they tasted was a little hit of tanginess at the end. A few people wanted the recipe, so I told them to check Food TV for chocolate cherry cookies. I’m not sure any of them ever go on line searching for recipes and at that moment, I felt kind of bad for not arriving with print-outs in hand. I like that Frinky hangs out by your cookbooks. Hope he forgets his vet visit by tomorrow. And love the suggestion about serving the red wine cookies at a wine tasting shin-dig. Yum! Heather, you are not blind. I hid the link pretty well! It’s up in the text, but here it is again. are you going to post the recipe for the cookies? Or am I blind & not see where it is? Everyone who hears me say his name thinks it’s Franky, but it’s Frinky. Todd named him after Professor Frink from the Simpson’s. Sometimes we call him “Frink”, and a lot of times I call him “Stink”. Now I kind of feel bad about that. Poor guy. Anway, he’s sitting here with me enjoying the sunlight and looking very content…..not like a cat with a raging cavity. I’m glad he doesn’t seem to be feeling any pain. The cookies look great. Your cat is so cute. I love cats. What’s his name? Hope his cavities get better soon. Well, my cat has conjunctivitis and he got some ointment. Turns out that was the least of his problems because he has two cavities and will have to get them extracted. Poor little guy. I dropped the cookies off at the school and the people who tried them loved them! Your poor cat. Hope he’s ok. This is a cool recipe! I want to try it…you always find the good stuff! Mmm, great idea – cookies especially for wine tasting! What a great idea- red wine in a cookie??? And I love your idea of serving them at a wine tasting party. Hope your cute, furry kitty is ok! Well you know I want to try this one. Badly. Hope the cat’s alrught.